The growing challenge nowadays for sugar beet growers is how to control herbicide-resistant weeds such as waterhemp and redroot pigweed. A recent study has shown that winter camelina planted immediately after sugar beet harvest can provide excellent control of these weeds. Sugar beet is an economically important crop in Minnesota with approximately 420,000 acres planted in 2017 (USDA-NASS, 2017). An average sugar beet crop rotation is a 4-year cycle with three years between sugar beet crops. However, production of sugar beet, like most annual row crops in MN, has the potential to impact the environment through nutrient and soil losses. Sugar beets grow actively only for a few months out of a year (i.e. planted in April or May and harvested in early September through October) therefore, the remainder of the year becomes a window of opportunity for these losses. Following sugar beet harvest, the ground is left un-covered from about Sept.- Oct. until April-May of the following spring. This can influence a decline in soil productivity caused by loss of nutrients especially nitrogen and phosphorus through erosion, leaching, and runoff. The bare soil during this period also provides greater opportunity for extensive weed growth without having any competition for resources such as nutrients, light, water etc., from other crop plants. Intense farming associated with sugar beet cropping systems also can lead to increased selection for herbicide-resistant weeds and the prevalence of other pests. The management of the multiple herbicide-resistant weeds, such as common waterhemp, is a challenge for sugar beet producers. Redroot pigweed is another annual weed, closely related to waterhemp which commonly escapes complete control in sugar beet fields; it has been identified as one of the worst weed problems in sugar beet. Thus, weeds remain an important source of crop and sugar losses throughout the greater sugar beet growing region. Thus, the challenge for farmers is not only to control weeds after harvest of sugar beets and to improve the soil productivity by preventing the off-site flow of nutrients, but also to minimize the costs associated with herbicide and fertilizers use. Thus, it is essential to integrate cover crops that will provide ground cover from late fall through early spring, keep the nutrients intact, compete with spring germinating weeds, maximize economic returns, and thus lead to enhanced environmental stewardship. Image 1: Weeds (left) and mature winter camelina right. 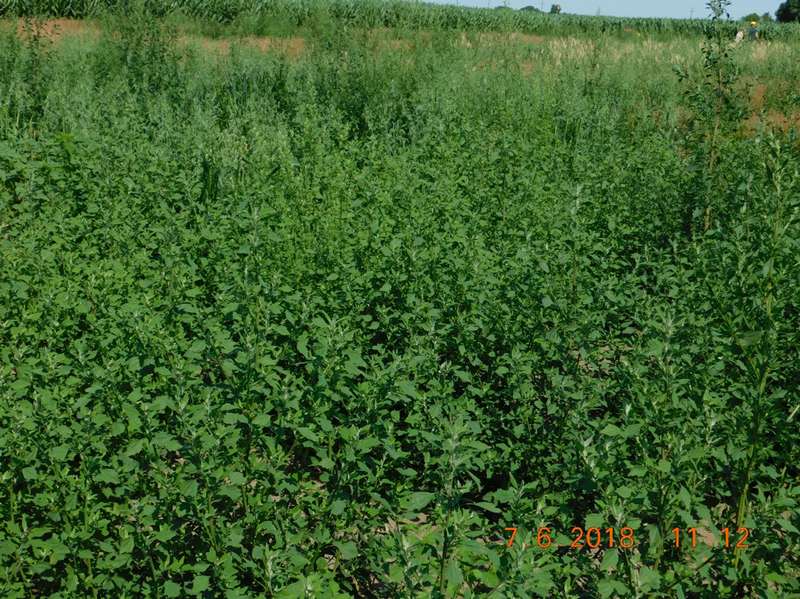 Image 2: Weed growth in the fallow treatment characterizing weed pressures at on-farm site. Integration of winter cover crops following sugar beet harvest can provide these benefits to farming systems by functional living ground covers from late fall through early spring, thus protecting soil from nutrient leaching and runoff. It can also improve economic benefits by suppressing growth of weeds. Winter camelina [Camelina sativa (L.) Crantz] is a winter-annual oilseed crop that offers the potential for producing a second crop after the harvest of a primary crop in the Upper Midwest. Winter camelina has a short growing cycle and an ability to grow in nutrient-deficient soils, tolerate drought, survive the harsh Upper Midwestern winters, and produce both food- and industrial- grade oil. Thus, it has the potential to provide economic benefits to growers. Earlier research has demonstrated that winter camelina can provide a suite of environmental benefits including nitrogen sequestration and pollinator habitat and forage. 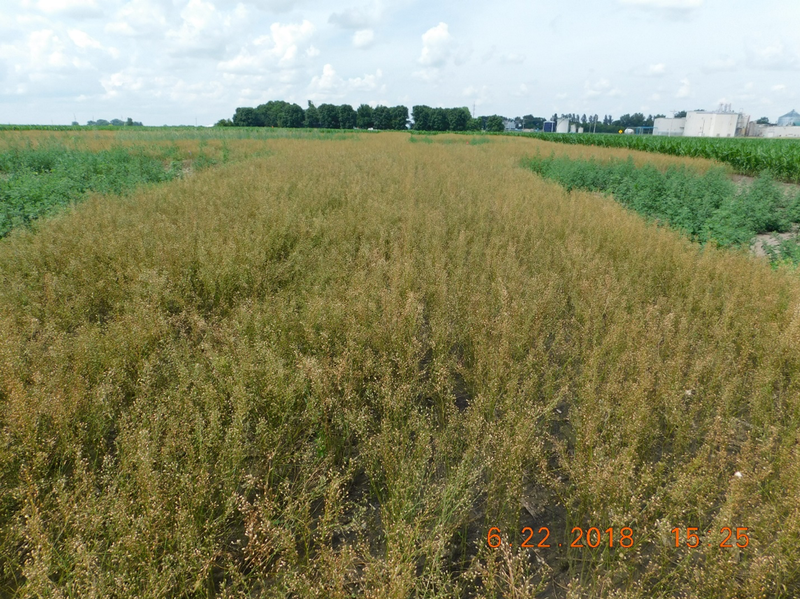 In the 2017 growing season, an on-farm research experiment in southern Minnesota was conducted to determine whether winter camelina planted immediately after sugar beet harvest would suppress the growth of the weeds. The proposed rotation for a sugar beet cropping system is sugar beet-winter camelina-short season soybean/drybean. The winter hardy camelina was planted in the fall (September) after sugar beet harvest. The four treatments included in the experiment involved two variables: drilled winter camelina crop and herbicide application. Treatment 1 consisted of winter camelina plus herbicide, Treatment 2 was winter camelina without herbicide, Treatment 3 was no camelina (fallow) plus herbicide, and Treatment 4 was no camelina (fallow) without herbicide. The experiment was replicated six times using field-scale equipment. 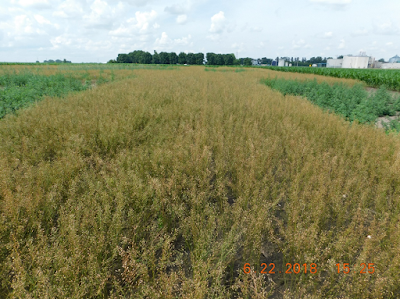 Weed-free (plus herbicide), and weedy check (no herbicide) treatments were used to characterize the degree of weed control affected by winter camelina. Early in the spring, the herbicide Dual II Magnum (metalochlor) was sprayed at a rate of 1.67 pts/A as herbicide factor in weed free plots. The percent cover of weeds was assessed in first week of July before harvest of winter camelina. 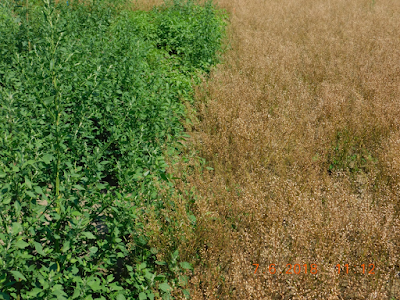 The following photo was taken on July 6, 2018, which shows the intense growth of weeds (green) as well as matured (light brown) winter camelina plants (Image 1). Figure 1. 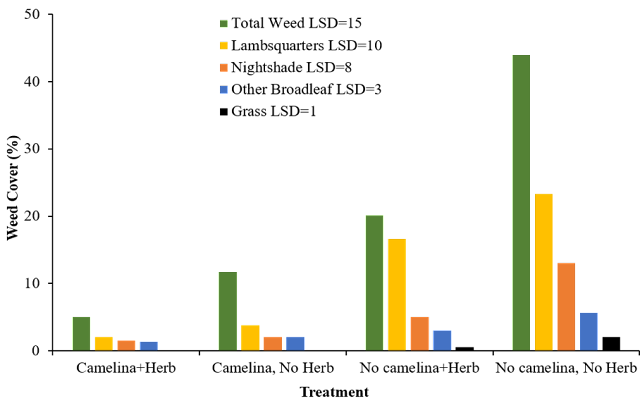 The +/- crop on the X-axis represents the presence or absence of winter camelina, and the +/- Herb on the same axis indicates the application or withholding of metolachlor herbicide. The Other Broadleaf category of weeds included pigweeds (waterhemp), dandelion, and purslane; the Grass category encompassed giant foxtail, barnyard grass, and woolly cup grass. Both categories were minor compared to the lambsquarters and nightshade populations. The treatments listed on the X-axis correspond to treatments 1, 2, 3, and 4, respectively. 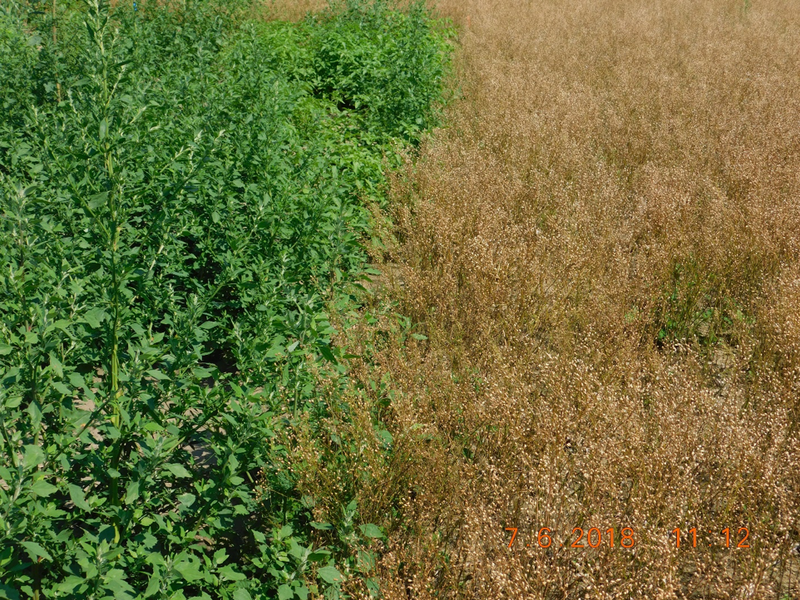 Results demonstrated that winter camelina along with the application of herbicide provided excellent control of weeds (Image 1-3 and Figures 1). The total percent ground covered by weeds in winter camelina sprayed with metalochlor was just 5%, while the percent ground cover by weeds was 20% without winter camelina (i.e., fallow plus herbicide plots). Without application of metalochlor, the percent cover of weeds was 12% in winter camelina and 44% with no winter camelina planted (i.e. fallow plots without herbicide) (Figure 1). 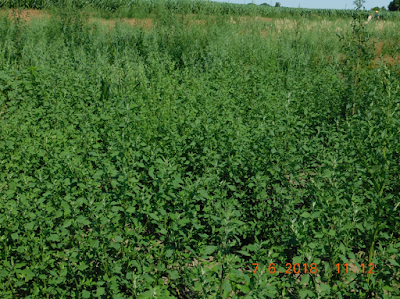 Thus, the research demonstrated that winter camelina inhibits weeds as well or better than metolachlor, as there was no statistical difference between the effects of metolachlor and winter camelina on weed cover. Thus, including winter camelina in a sugar beet cropping system can increase economic benefits by reducing the need for applying herbicides. Additionally, the University of Minnesota, in collaboration with Agriculture Utilization Research Institute (AURI), and the Agricultural Research Service (USDA-ARS), is working to establish supply chain connections and develop the market opportunities for this winter hardy camelina crop to improve the economic sustainability of farmers in Minnesota. Support for this project was provided by the NCR SARE Research and Education Program. Contact: M. Scott Wells email:mswells@umn.edu for more information.